Bachrach is an educational assistant at the United States Holocaust Memorial Museum, and is initially geared to young children. Based on personal portraits of children, she tells the persecution of the Jews from 1933-1945. This book by Bob Moore is considered by many to be a new standard work. He gives a subtle and chronological overview of the persecution of the Jews in the Netherlands, and gives answers to the question, "why were so many Dutch Jews killed?" Robert Jan Van Pelt and Deborah Dwork, both involved in the planning of the new layout for the State Museum Auschwitz-Birkenau, pool their knowledge to bring a meticulous history of the concentration camp. A controversial book by Daniel Jonah Goldhagen, which has received enormous media attention and provoked renewed debates among historians of the Holocaust. Zygmunt Bauman denies that anti-Semitism is an adequate explanation for the Holocaust. A thought provoking book into how people can hide from their deeds behind bureaucracy. In this,the first part (of two parts)Saul Friedlander covers the history leading up to the annihilation of the Jews. The Goldhagen book resulted in a number of articles and books often fiercely critical of his study. Norman Finkelstein and Bettina Birn accuse him of using source material rather selectively and of purposely omitting certain issues. I first read "The Diary of Anne Frank" when I was in school, at least thirty years ago, and couldn't imagine how it must have felt to have lived in that time, when such awful things were going on. Not knowing from one day to the next what might happen to you. Dreading the knock on the door. I knew it HAD happened, had seen the news reels on the television programme "All our Yesterdays", but still found it hard to understand how PEOPLE could have done that to other people. Visiting "The Anne Frank House", at 263 Prinsengracht, in Amsterdam opens your mind once again to all the horrors of that time. It took me thirty years to make the journey, but in May of 1999, I finally made my way there. The Prinsengracht is a quiet, tree-lined street alongside one of the many canals running through the heart of Amsterdam. In ways, it probably looks very much as it did in Anne's day, other than that the traffic has increased. The buildings are narrow and tall, because property taxes used to be paid on the width,in footage,of the houses so they were built upward. Inside,the stairs are very steep, attempting to take up as little space as possible. In such a tranquil setting, it is hard to imagine the horrors of Nazi occupation, even allowing for fifty years to have passed. It is also difficult to comprehend the "faceless millions" who were exterminated, and realise that they, too, were mothers and fathers, brothers and sisters, sons and daughters. That they had people who loved them, families and friends, and hopes and aspirations like the rest of us. They were not numbers in a history book, each one was an individual, a gift to this earth - their lives taken because of one man's hate for a part of his own self. Anne Frank would have been yet another faceless statistic, except for the fact that her writings remained, and were published after the war. She was the testimony of all that happened. The front of the house is drab, and changed only a little from fifty years ago, in that where (facing the building) the ground floor facade consisted of three sets of double doors, now there are two sets and the farthest right is now half wall and half window. It was Otto Frank's wish that the house be restored, if possible, because he wanted it to remain the way Anne spoke of it in her diary. Likewise, visitors are often dismayed that the rooms are empty, other than the pictures and clippings stuck on the walls of Anne's room. When the family was captured, the Nazis looted the building. Otto Frank wanted the rooms kept as they were when he returned there after the war, and his wishes have been honoured. Their very emptiness speaks volumes. The silence as people walk through is amazing, there is an awesome respect for what they are experiencing. Many write in the guest books, some moved to silent tears. I felt a kind of guilt, knowing that similar crimes against humanity are still going on, and that we feel powerless to stop them. Although the "Secret Annex" is larger than one imagined, realising how many people lived there soon dispels the myth of space, and thinking of the restrictions placed on their daily lives leaves you wondering just how they managed it, day in and day out, without going crazy. Not being able to open a window on a hot day, run water, sometimes not even being able to walk around in case the floorboards creak and somebody might hear. All things we take for granted, and that Anne, and the others, gave up in order to survive. 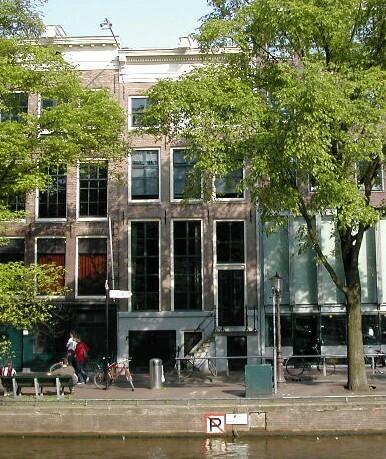 The Anne Frank House now owns the building next door, and work has been going on, to turn it into an addition to the original house - the extra space will be used for exhibitions, a multimedia resource centre, a reception hall for large groups, and offices. The Anne Frank House chooses to combat racism and anti-Semitism through information and education. If you would like to support the work of the Anne Frank House, a minimum donation of the equivalent of 50 Dutch guilders, you will become a "Friend of the Anne Frank House" and receive the Annual Report and the Anne Frank magazine. here to go directly to the website for the Anne Frank House. This site is connected to various information sources about the Holocaust, with the emphasis being on education. Interactive modules, and virtual tours. This site offers a lot of information about the museum in Israel, Jewish life before the Holocaust, Jewish Resistance and the Holocaust itself. A beautiful site from the Jewish Historical museum in Amsterdam containing lots of (interactive) information about Jewish history and the Jewish people. A very impressive site allowing visitors to take virtual tours through the museum and various exhibitions. Links to books on various aspects of the Holocaust. Just what it says - more of the above. This page has been visited times since it was created on June 23rd 1999. I thank you for stopping by, and hope you'll come again.